Designed specifically for the busy laboratory, the Twin UCA will handle the everyday testing with faster turnaround time and less lab space. The cell is much easier to handle making it more user friendly than the large UCA cells designed for more extreme downhole conditions. The acoustic measurements are read by an internal computer which automatically performs the complex strength calculations. 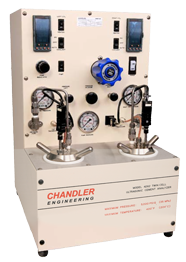 All test data including the compressive strength results are then transferred to a Windows capable computer, running Chandler Engineering Model 5270 Data Acquisition Software. The software produces real-time graphs of the calculated strengths, measured temperatures and transit times.